Every now and then, a person is lucky enough to come up with an idea that’s pure genius. I consider myself endlessly lucky to have a platform, both here on the blog and in my magazine column, where I can share my occasional stroke of brilliance with a couple of folks. Well this one was one of my most incredible strokes of genius. Ages ago, I posted this Zebra Cake. Then I took it a step further with this ever popular Zebra Bundt Cake. And ever since then, the concept of zebra cakes and such have been in my head constantly. 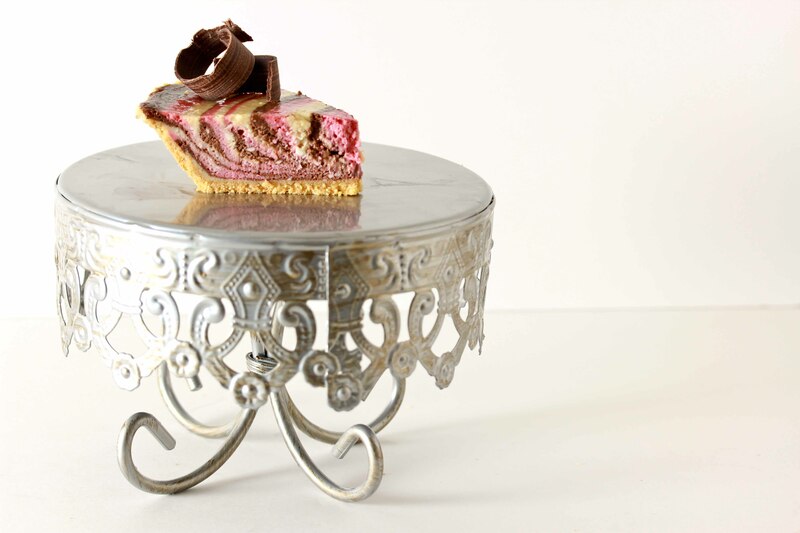 I wanted to create a zebra cheesecake, but plain chocolate and vanilla has been done so many times, and I wanted to do something a little more extraordinary. 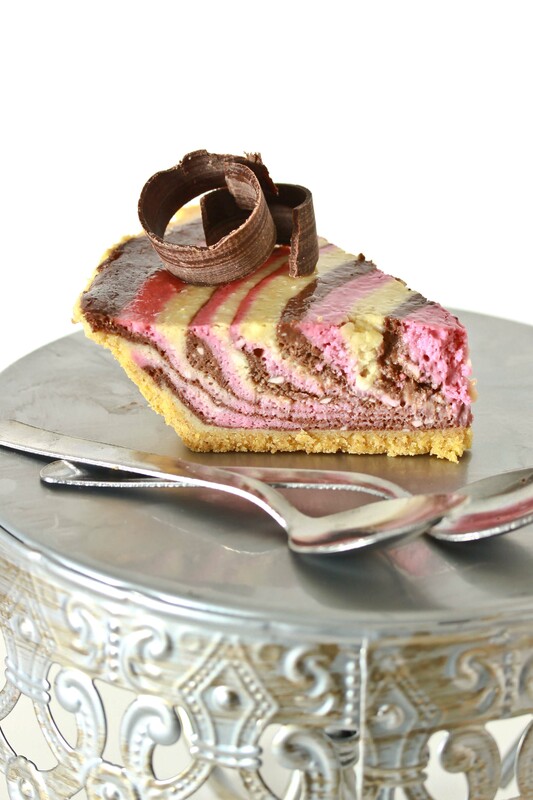 That’s when I came up with the idea of this Neapolitan Zebra Cheesecake. It’s gorgeous, it’s impressive, and the flavors are simply awesome together. After all, who doesn’t love this amazing flavor combination? The recipe was published recently in my magazine column, and it might have been my most popular recipe ever. Facebook blew up with my amazing readers posting pictures of this gorgeous cake, so I knew I had to share it with my lovely blog readers. Next time you want to impress, make this cheesecake. It’s not as complicated as it looks. It’s a matter of making three quick batters, then spooning them in carefully. Go ahead. You know it’s worth it! Mix together the graham crackers, sugar and melted butter until combined. (It will have the texture of wet sand.) Press along the bottom and up the sides of a 9 inch springform pan. Press a round measuring cup along the edge to smooth it out. Place the crust in the freezer while you prepare the batter. To prepare batter: combine all ingredients for strawberry mixture in a bowl. Whisk until smooth. (You can do this with an electric mixer or a whisk.) Set aside. Repeat to make chocolate and then vanilla batter. Remove the crust from the freezer. Place a small scoop (*see note) (about 2-4 Tablespoons) of the vanilla batter in the center of the crust. Next, place a scoop of the chocolate mixture in the center of the vanilla. This will cause the vanilla mixture to spread out. Then, place a scoop of the strawberry mixture in the center of the chocolate, again, this will push the chocolate mixture out towards the edge. Bake the cheesecake at 350 for 65 minutes. To prevent cracks, turn the oven off and leave the cheesecake in the oven to cool slowly for at least an hour. If you don't want to make your own crust, divide the batter between two pre-made graham cracker crusts and bake for 40-45 minutes. *Note: I heard from many readers who used squeeze bottles and piping bags to place the batter in neat, even circles. This might also make the process easier. Wow, now that’s a cheesecake! Beautiful! Crazy how viral this recipe went! Well deserved Miriam! This is the first I’ve seen of it, so thank you for sharing it on the blog! It’s gorgeous and SO clever. No wonder it was a hit! My sis made this for shavuos. Was awesome and gorgeous!!! Reminds me of the Zebra clown from Madagascar !! 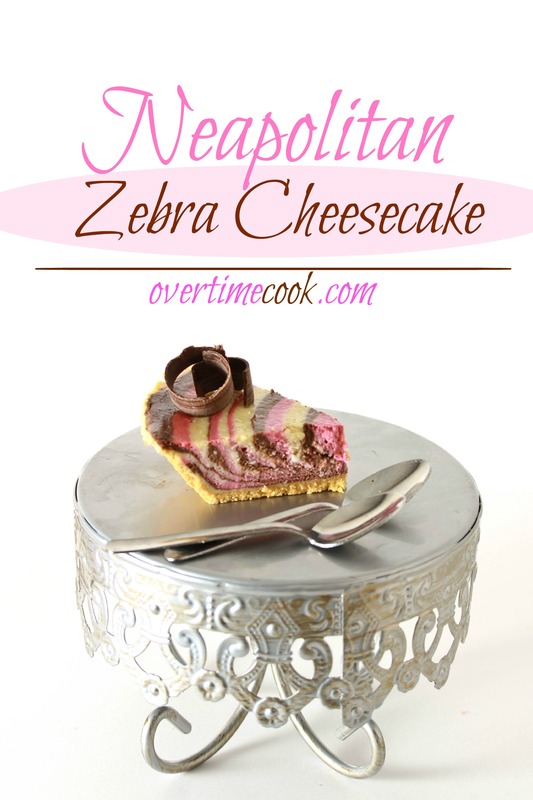 Your cheesecake looks great, I love the Neapolitan theme. Adore the swirling neapolitan colors and flavors! A terrific dessert! I’ve got loads of healthy recipes in my archives. Check out the recipe index. Enjoy! This looks amazing! Such a good idea. Love this. Seriously so cool looking!! Impressive indeed! My first thought when I saw the photo of this gorgeous cheese cake was, “Wow!” Thoughts of imagined cakes and cookies can keep a person up at night, but if the result is an inspired recipe like this, its worth it! I made this and it came out really great. I only used chocolate and vanilla but increased each batter by 1.5 times to make it the same size. My only suggestion is to cream the cream cheese and sugar first before adding the other ingredients to avoid cream cheese lumps! But great concept! Dang woman, this is something else. Really gorgeous, this is a stunning. This is a neat idea, I make the Neapolitan cupcakes and cake, but never thought of making a cheesecake out of this recipe. I have to try this but I will used my own recipe . Thanks for the idea. Please visit my website, and I’m on mobile as well. Have a bless and Happy New Year. Just wondering if this desert can be frozen?! Love making cheesecake and this one is amazing! I actually tried this one last year when you posted it, however I guess I failed on the amount of each flavor as I placed it into the pan! The end result was not impressive and defined like yours! Any tips that you can give me before I try it again!!! Do you think I can make this crustless? How long would you bake individual cheesecakes? How many would this make? If I use a pre purchased graham cracker crust, do I use the same quantity of ingredients or do I reduce it by half? It seems quite small for so much cream cheese and other ingredients. Thanks for letting me know. … i am a big fan of yours all the way from Zurich. Divide it between two graham cracker crusts. Thanks, Could you also add measurements in grams on your recipes? I recently learned that Karin Green, a popular Israeli cookbook author, has a famous cheesecake that is called a bullseye cake, which you would probably call a zebra cake. I am getting so psyched for Shavuot! !